Even in the early works like ‘November Night Trees’ 1966 we are already dealing with a bringing together of somewhat contrary approaches to abstraction and Wragg is openly abstracting from a felt experience in the world. (He is happy to tell us how direct visual or felt experience has informed his practice throughout his career with excerpts taken from a major book appearing by the works.) Hard-edged box-like forms hang in an altogether dusk like misty drifts of greys, greens and scumbled blacks. Deep blue diagonals glow ominously as they flit through the darkness. This bringing together of a hard-edge vocabulary with a thin, atmospheric and lyrical painterliness at first might seem jarring. But in actuality a brooding and compelling tension is achieved through the orchestration of opposites. Trying to articulate the nature of these forces or focused energies in painting is difficult. The difficulty is only increased by certain attitudes to overtly physical and painterly abstract art. What I don’t mean by ‘forces’ is a ‘force of personality’. 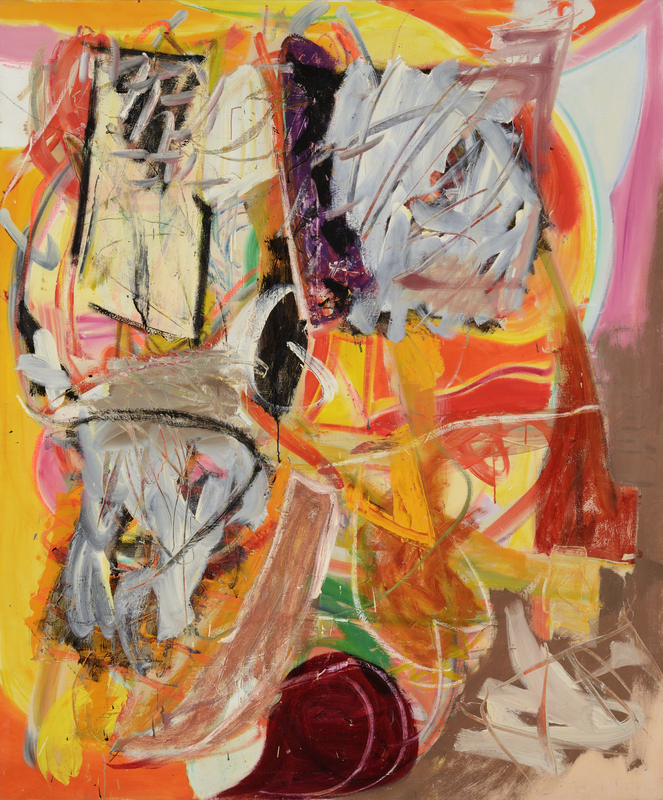 To say that a successful historical Ab-Ex painting is one that truly reveals the nature of the artist who made it is a cliché that can only undermine the real value of a de Kooning, Kline or Pollock et al. These works have to operate on so many other levels, through visual qualities that can only be registered in the paintings themselves, not in lazy generalisations about artists’ motives, artistic or otherwise. Whether or not a painting gets close to revealing some essential truth of a painter’s personality or some notion of an authentic self is pure conjecture. It is riddled with the good old-fashioned hocus-pocus that perpetuates the cult of personality in the field of the fine arts. Not only is this one-dimensional interpretation of physical -painting naive, but it is often used in a frankly disingenuous way by critics of this approach. The negative criticism that focuses solely on the ego driven mania of the usually male artist has been absolutely taken for granted for the last 30 odd years. I only mention it here because one has to sweep all that baggage to one side to see what’s really happening in a good Wragg painting. As I tried to outline above, citing Pollock and de Kooning would be too easy. I believe it would not do justice to the openness and decidedly diverse and mind-bogglingly differing energies at play in this show. 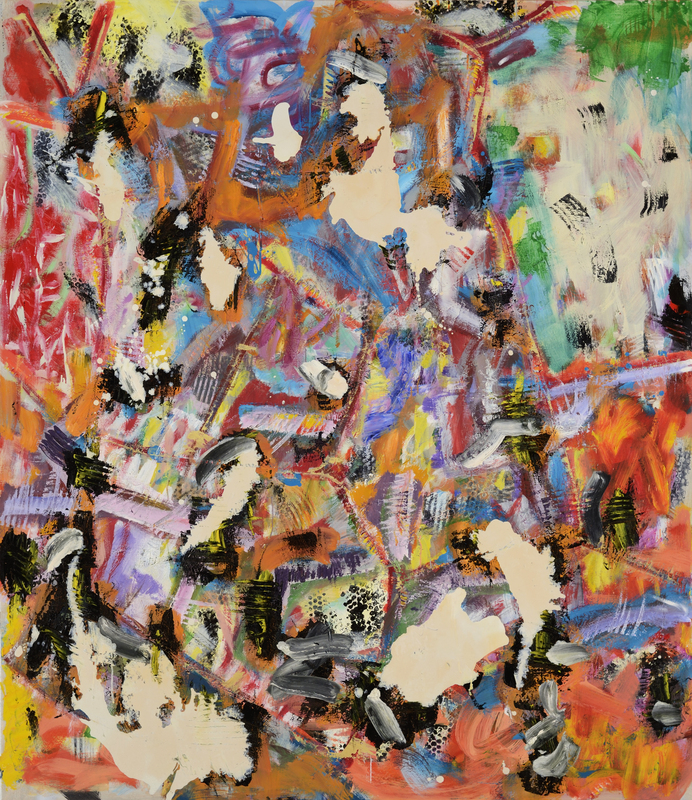 Like the Ab-Exers mentioned though, Wragg is not afraid to use drawing in painting and because of that, I think, there’s a different and deft sort of physicality in operation that is all Wragg’s own. It appears throughout this show in many different guises, whether overtly as in ‘Subi’s Entrance’, 1984, or in an ethereal and subtle form as in ‘Singing Blood’, 2006-7. It’s a kind of spatial painting that does not need to be contained and ultimately subdued by some singular organising principle or other. There is so much abstract painting about that lives solely on repeated ‘forms’, grids or densely packed and worked rectangles that ploddingly push us across a painting in that sort of visual ‘call and reply’ type way. Wragg’s work generally does not rely on too-obvious colour contrasts or dramatic meetings of ‘edges’ to sustain interest. Nor are we expected to endure what an insightful critic recently described as ‘death by a thousand flecks’ where a painting becomes too granular, self-referential and mired in ‘process’. However, we may get aspects of all these elements of picture-making as Wragg openly grabs from modernist painting’s history of forms or, with equal fervour, the memories of sensations or visual triggers activated by interactions with the real world. Not only are there hints of that world revealed in colour and shape, but more importantly, we get glimmers of how those experiences are felt and then become manifest in the physicality of the painting process. In ‘Carnival‘ there are a multiplicity of organising principles at work driven directly by the way paint is expertly manipulated in a myriad of ways in different areas or zones of the painting. There is a weighty density to the blacks in the bottom left/centre that sit within the triangular white shard pointing upward to the centre of the work. This is countered by another white triangle, this time holding in a strong deep red. This direct drawing is subtly subdued by a change in speed and an altogether different lightness of touch coming from the billowing creamy yellows rising from the bottom right. Suddenly the painting feels full of air and light. Any sense of a background starts to push forward and fragment as it does so, a powerful red pushes forward off the pink ground from top right to centre. It is held down by another white shard, larger and slightly more aggressively realised. Its points push out toward the centre right and out to the left seemingly to be challenged again by cascading pulses of longer black brush strokes splitting open and fraying the blue top left corner and snaking down the left edge. This blue ground then seems to atomise to become like a cloud of gas seeping through the angular black striations and mixing with the drifting creamy white and yellows and greens culminating near centre top. The greens here seem to be pushing out from left to right into the painting leaving the frayed blue left edge of the painting to lean in like a hugely enlarged section of a door frame from a Bonnard interior. Look at how four curved bands of a deeper richer pink twist open the bottom centre of the painting, spatially opening up the play of forms above so delicately. In all this there is the courting of chance, yes, but never a wholesale surrender to it. 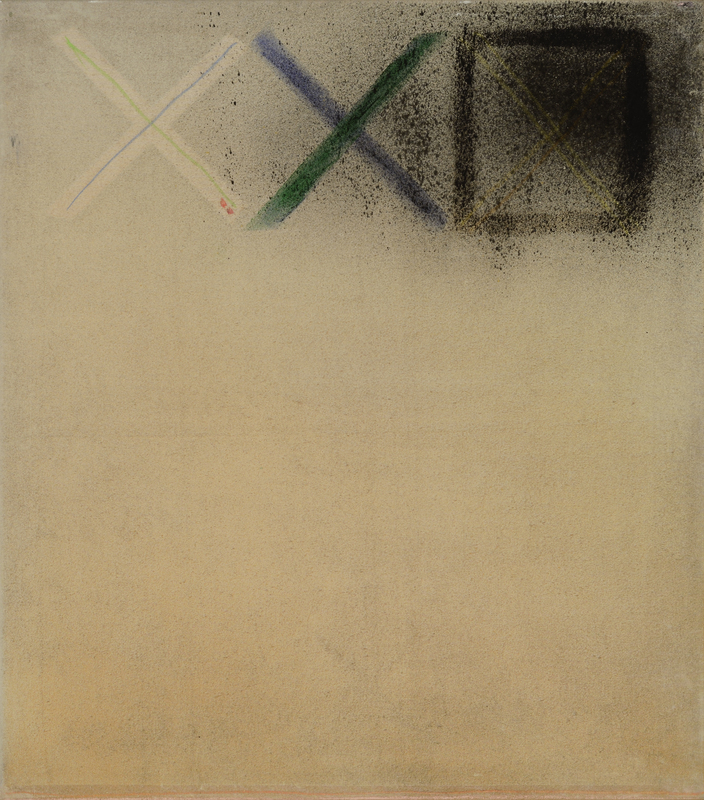 If there is a single-mindedness to Wragg’s approach to painting then it is revealed in the complex layering or accumulations of signs and gestures rather than it being marked by a rather cliched series of unremitting Modernist reductions. However, Wragg’s trajectory so far can be marked by periods of analysing structure in picture-making requiring significant simplification of form and nuanced colour relationships. But even some of these, such as ‘Green & Black Rectangles’ 1974 have their basis in real world experience such as a football pools coupon, for instance. If there is an underpinning architecture at play in the later works, it is one born of multiplicity of forms and a recognition of paint’s natural affinity with human physicality. If they are abstract, then they are also spatial and hugely elastic in the forms and approaches they attempt to encompass. They are dynamic and ambitious about what can be held in a captivating balance rather than what can be reduced to rather dubious notions of ‘essences’ and ‘authentic gestures’. “Three separate fragments as one. Spiders webs, paving stones in Normandy and internet fragmentation of data and sensations of time and space…” Although I wouldn’t want to reduce the impact of the painting ‘Webzone X Three Into One’ by referring to any accompanying text, I think the words sum up the challenges that Wragg might set himself in the wider painting process. The challenges, though, must be met in the painting itself, the results being a visual statement first and foremost. 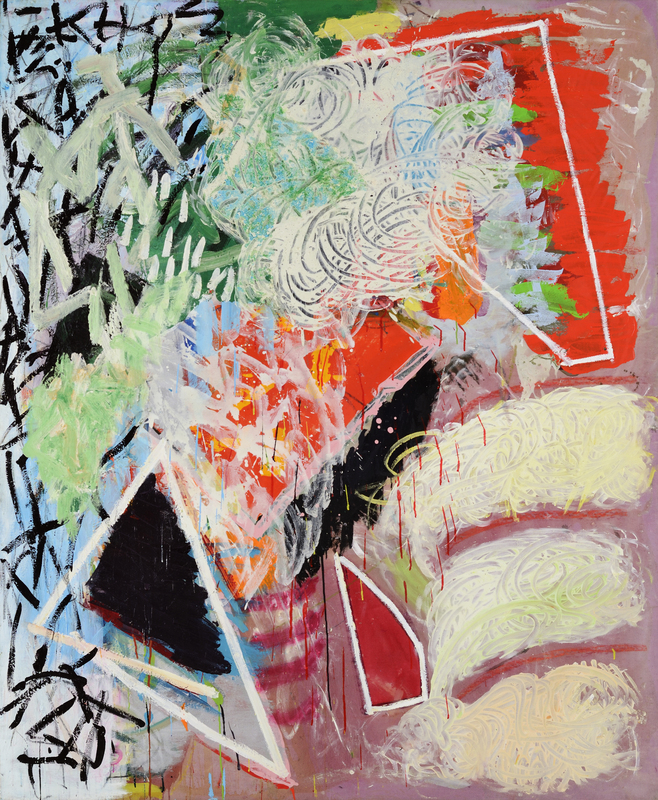 There is an extreme diversity of brushstrokes and layering in ‘Webzone’. The sensation is like a visual pulsing that runs around the surface; this pulse is interrupted by bland scraped-up beige fragments that remain resolutely on the surface. But their kind of crumbling density seems suddenly to give way and the eye is channelled deep into the painting. This oscillating effect seems to hinge on the interplay of yellows, oranges and blues fragmented by those sharp brush marks that almost start to produce facets in a kind of molten cubist space. As the eye moves deeper, more and more nuanced colour reveals itself in snaking violets and blues. A splash of cooler green moving down from top left brings us back up to the surface once more. A sense of pressure, rotation and friction built from a myriad of forces and counter forces produces a singular singing surface. In these contrasts and subtleties lies Wragg’s originality. 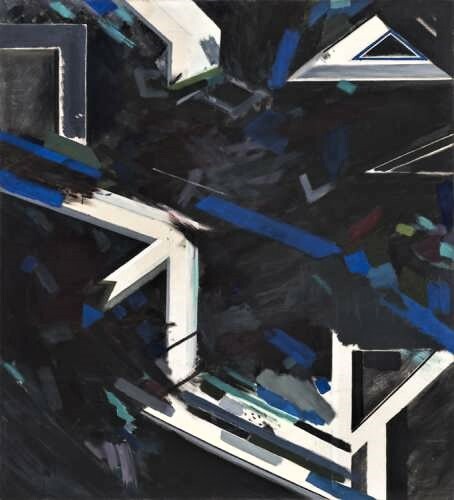 Wragg’s best works are a challenge to a rather tired idea about Modernist art (both gestural and reductive strands), and at the same time a timely riposte to the circularity of references at work in the worst of the meta painting born of our post-modern era. Wragg’s interesting mix of references always manage to add up to more than the sum of their parts. Much has been made of the re-evaluation of Monet’s ‘Water Lily’ paintings by second generation Ab-Exers. 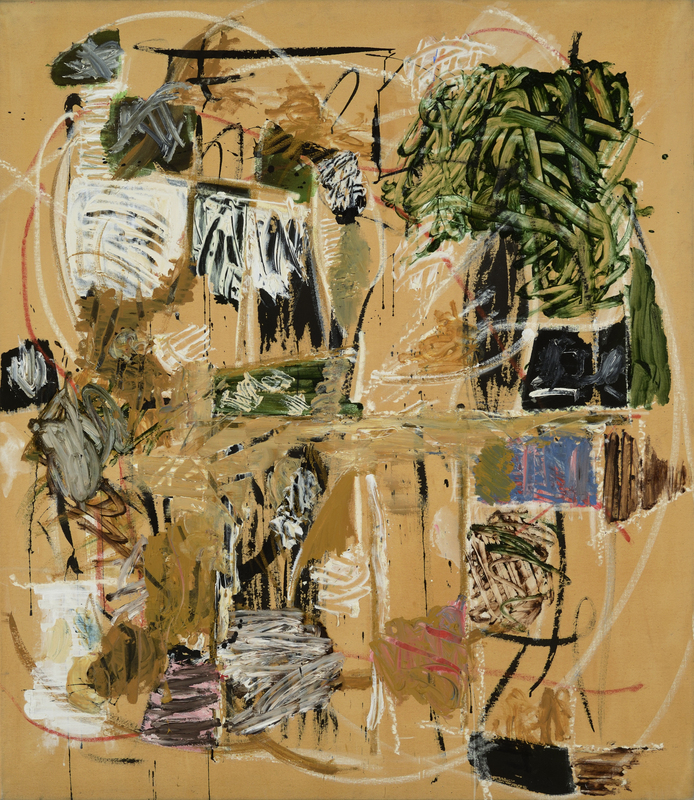 Joan Mitchell’s painterly calibrations of sensations experienced in the landscape, rather than depicting the landscape itself, chimes with aspects of Wragg’s approach. In Wragg’s colour, generally, I can see Monet and Renoir for sure. But its Bonnard’s edgy and tensile paint work and the fertile tensions between fluidity of bodily forms and architectural space in Matisse that feel like the more palpable and guiding influences. But then we have to add the breakthrough Americans of the post-second world war period, such as those mentioned above and others like Tworkov. But I would also throw in Europeans such as Hartung and aspects of the School of Paris. I’d even mention British stalwarts of figuration Auerbach and Kossoff too, especially in their London landscapes. This open embracing of history, again questions that pervasive cliched idea that the history of abstract art is a linear narrative of progress through exclusions. 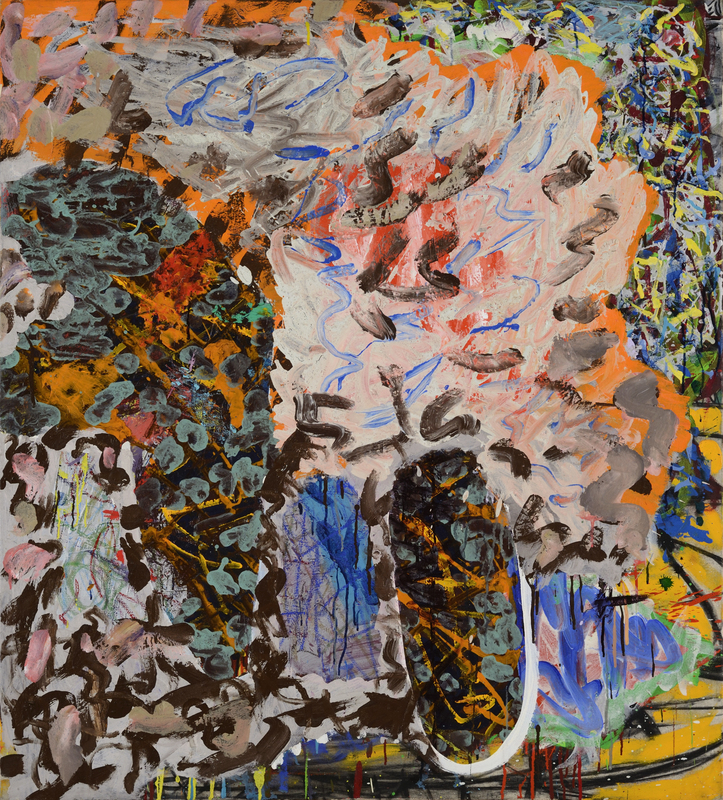 Wragg is happy to rub one set of painterly values, approaches and architectures up against another. The friction created seems to fuel invention as it reveals itself as a profound orchestration of impulses, reactions and counter-actions all held so compellingly together in the articulation of the paint itself. …but there are subtler examples, where the circle drawn inside the rectangle underlies all the frantic scribble (and predictable quartering of the canvas) on top, e.g. “Subi’s Entrance” and “Saltinbanque”, so I don’t think it’s true to imply that Gary avoids all the obvious tropes of modernism. Drawing the circle (or circles) inside of the rectangle, or wheeling it around in the centre, is maybe something John doesn’t see, or doesn’t mind, because it happens now and again in his own work, and it’s so obvious that maybe it’s hidden in plain sight (for example, I think there is quite a strong resemblance in the way John’s “Wraysrumble” and Gary’s “Subi’s Entrance” are organised). For me, this subliminal composition is too much of a cliché. And do I need to say that I think in John’s best new work, he’s gone way beyond that? I do think, in general, that John makes good points here, especially about being adventurous and at least trying to avoid formats. And I do admire Gary and his persistence. The paintings that immediately appealed to me in this show because they straight away looked more nailed as “whole” things – “Blue and Orange” and “The Barn II” – didn’t sustain that interest for long. The ones that John champions are riskier. I’d like to run with these riskier ones, but risk and consolidation are both needed in the mix. You cannot rely upon idiosyncrasies to get you through, all the way. But we are back to the perennial question of whether the deficiency is in one’s own appreciation, or in the painting itself; referring to John’s own feed on Brancaster recently: is it my conservative taste that spits out bits of the linear stuff in John’s new collages, or is it the linear bits of the work that spit me out as I try to visually navigate around them through the content? Does my taste prevent me from really fully appreciating the achievement of “Carnival”, or is the painting itself just not pulling together enough to take me with it? In the end, these are gut judgements, not available to theorising. This may be a bit left field ,but I was in London for Bernard Cohens breakfast at the Tate Britain ,where I went straight to see the Cezannes at the NPG and then to Garys show at Paisnal.Let me say I take my hat off to the Paisnal gallery for showing an artist so obviously alive and kicking.Ive known Gary since we showed together at MOMA oxford straight out of college.I also remember his big show at the ACME gallery,where he mixed drawing and paint very successfully.I have to say I was a little disappointed,particularly the way an abstract expressionist activity stresses the surface,particularly the Rhoplex PVA,which looked frothy..However its perhaps not fair ,as the Cezannes were so knock out on so many levels,that it was an impossible act to beat.What I loved about that show ,vis a vis Robins last remark ,was that there was no uncertainty about ones reaction .Cezanne communicates his struggle as an artist ,that we all go through ,with such candour ,I felt extremely moved by the paintings ,all portraits,altho I am not a figurative artist.I must say I got off on the furniture,draperies and organisation of the whole ,as much as the expression in the faces.An exception is the Courtauld picture with the white clay pipe,a masterpiece if there ever was one.I breathed in the Cezannes and haven’t digested them yet ,except to say since the Matisse at the RA,I think this show is second to none.The Cohens were very good also,working across a large room .Thats on for 6 months and suggest a visit.What a feast of riches!